The Drake Passage or Mar de Hoces -Sea of "Hoces"- is the body of water between the southern tip of South America at Cape Horn, Chile and the South Shetland Islands of Antarctica. It connects the southwestern part of the Atlantic Ocean (Scotia Sea) with the southeastern part of the Pacific Ocean and extends into the Southern Ocean. 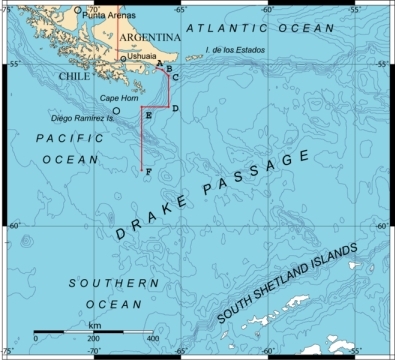 The passage is named after the 16th century English privateer Sir Francis Drake, whose only remaining ship after passing through the Strait of Magellan was blown far South in September 1578 and who implied an open connection of the Atlantic to the Pacific Ocean. Half a century earlier, after a gale had pushed them South from the entrance of the Strait of Magellan, the crew of the Spanish navigator Francisco de Hoces thought they saw a land's end and possibly inferred this passage in 1525. For this reason, some Spanish and Latin American historians and sources call it Mar de Hoces after Francisco de Hoces. The first recorded voyage through the passage was that of the Eendracht, captained by the Dutch navigator Willem Schouten in 1616, naming Cape Horn in the process. The 800 kilometres (500 mi) wide passage between Cape Horn and Greenwich Island is the shortest crossing from Antarctica to the rest of the world's land. The boundary between the Atlantic and Pacific Oceans is sometimes taken to be a line drawn from Cape Horn to Snow Island 130 kilometres (81 mi) north of mainland Antarctica). Alternatively the meridian that passes through Cape Horn may be taken as the boundary. Both boundaries lie entirely within the Drake Passage. The other two passages around Cape Horn, Magellan Strait and Beagle Channel, are very narrow, leaving little room for a ship, particularly a sailing ship, to manoeuvre. They can also become icebound, and sometimes the wind blows so strongly no sailing vessel can make headway against it. That's why it's the roughest sea in the world. Hence most sailing ships preferred the Drake Passage, which is open water for hundreds of miles. The very small Diego Ramirez Islands lie about 50 kilometres (31 mi) south of Cape Horn. There is no significant land anywhere around the world at the latitudes of the Drake Passage, which is important to the unimpeded flow of the Antarctic Circumpolar Current which carries a huge volume of water (about 600 times the flow of the Amazon River) through the Passage and around Antarctica. Ships in the passage are often good platforms for the sighting of whales, dolphins and plentiful seabirds including giant petrels, other petrels, albatrosses and penguins. The passage is known to have been closed until around 41 million years ago according to a chemical study of fish teeth found in oceanic sedimentary rock. Before the passage opened, the Atlantic and Pacific Oceans were separated entirely with Antarctica being much warmer and having no ice cap. The joining of the two great oceans started the Antarctic Circumpolar Current and cooled the continent significantly. This page was retrieved and condensed from (http://en.wikipedia.org/wiki/Drake_Passage) see Wikipedia, the free encyclopedia, April 2009.